Happy new year fellow bloggers, I hope you all had a wonderful time over the festive period. I experienced my first white, snow-dusted Christmas in my 22 years of life, which was better than any present I could have been gifted. The dawn of a new year always brings a new outlook on life for me, and this year I have decided it is the moment to seriously re-evaluate how I consume. Food, fashion, drink; we seem to be living in an age of over-consumption which I no longer wish to subscribe whole-heartedly to. Plus the VAT increase has forced me to realise it's time to embrace a new outlook of austerity. So my new years resolution is simply to buy less, and to purchase better quality goods when I do part with my hard-earned pennies. Of course, that's not going to stop me shopping/ reading about/ fantasising about fashion. 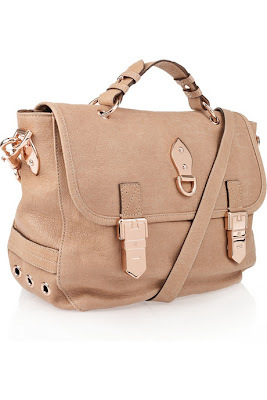 Top of the never to be fulfilled wish-list, the luscious blush coloured Mulberry Tillie bag, 795 of anti-austerity heaven.